Enjoy your morning coffee at our Mission breakfast nook set. This Mission Banquette Seating Set creates a cozy nook in your kitchen that is beautiful and durable. Your whole family will have plenty of room to sit with the L Shaped Nook. 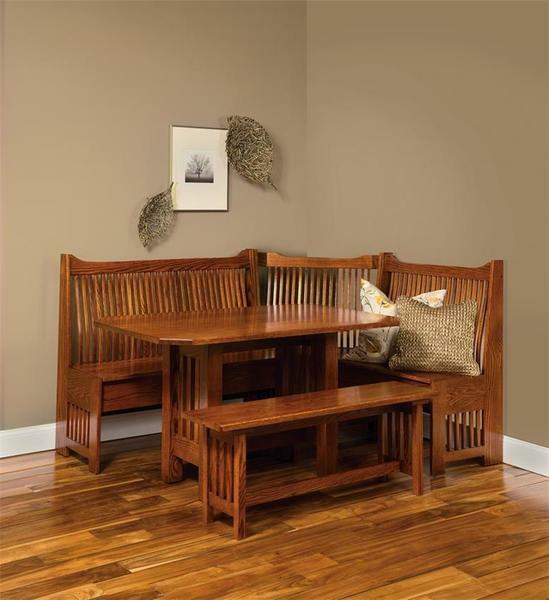 This corner nook dining set is handcrafted in the traditional Mission style, with characteristic Mission stretchers forming the seat backs. Customize the look with our beautiful walnut wood diamond inlays on the bench backs for a unique Craftsmen look. The curved back slats make for a comfortable spot to sit. The nook benches have 6" storage areas inside for ease of storing away kitchen accessories. If you prefer chairs instead of the separate trestle bench that comes with this Amish breakfast nook set we will be happy to help you select matching chairs - just call one of our furniture specialists for assistance, 866-272-6773. Available in a variety of solid hardwoods and a wide range of finish options, this breakfast nook set is handcrafted with superior workmanship. It is made by the Amish, who take pride in building every piece of furniture with integrity and authenticity. You'll be impressed with the results of their labor! The benches comes standard with beautiful solid wood seats, but are also available in an upholstered option. Please call for pricing on customized large bench and small bench sizes. Our Amish breakfast nooks can be interchanged to fit in a right or left-facing corner. Individual pieces are also available - please call to speak to one of our helpful Amish furniture specialists for pricing. We offer a wide variety of breakfast nook sets in many styles and sizes. Some assembly is required by just connecting six connector bolts. Dimensions along one wall: 72" x 20" x 41"
Dimensions along other wall: 59" x 20" x 41"
Table: 34" x 54" x 30"
Corner no Storage: 24" x 24" x 41"
Storage Bench: 34" or 48" x 20" x 41"
Plain Bench: 48" x 12 1/2" x 18"
Custom Sizes and Individual Product Pricing is Available. Please Call For Assistance.